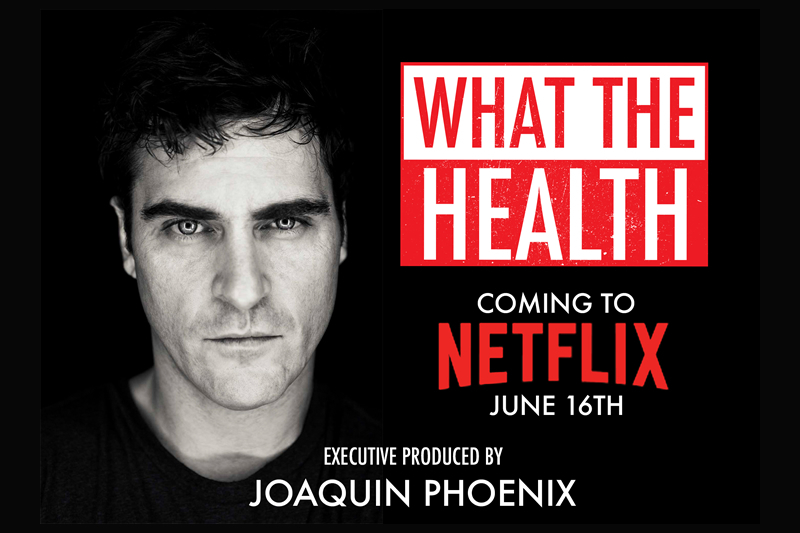 LOS ANGELES, CA / ACCESSWIRE / June 13, 2017 / The feature-length documentary "What the Health" will be available on Netflix starting June 16th. Golden Globe® winner Joaquin Phoenix has come on to executive produce the film. "I considered myself very well informed on the benefits of a healthy diet, but 'What the Health' opened my eyes to the sinister influence of the pharmaceutical, agribusiness, and processed food industries," said Phoenix. "This is the largest health cover-up of our time, and I knew I had to help bring this information to the American public so we can create change." "What the Health" uncovers the secret to preventing and even reversing chronic diseases, including heart disease, diabetes, and various forms of cancer – and investigates why the nation's leading health organizations don't want us to know about it. The groundbreaking follow-up film was co-directed by Kip Andersen and Keegan Kuhn, the creators of the award-winning documentary also featured on Netflix, "Cowspiracy" was executive produced by another socially conscious star - Leonardo DiCaprio. With the help of medical doctors, researchers, and consumer advocates, "What the Health" exposes the collusion and corruption in government and big business and health organizations like American Diabetes Association, American Cancer Society, and the American Heart association that is costing us trillions of healthcare dollars, and keeping us sick. With heart disease and cancer the leading causes of death in America, and diabetes at an all-time high, the intrepid filmmakers track down the leading and most trusted American health nonprofits to find out why these groups are staying silent, despite a growing body of evidence. Surprising, and at times hilarious, the documentary features the insights of urgent care physician Dr. Milton Mills; bariatric medicine specialist Dr. Garth Davis ("Big Medicine"); Dr. Neal Barnard, president of the Physicians Committee for Responsible Medicine; physician and bestselling author Dr. Michael Greger ("How Not to Die"); NYU School of Medicine professor Dr. Michelle McMacken; public health attorney Michele Simon ("Appetite for Profit: How the Food Industry Undermines Our Health and How to Fight Back"), and many more.